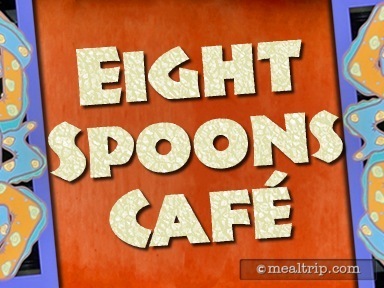 The Eight Spoons Cafe Kiosk at Animal Kingdom is located across from the Adventurers Outpost, on a walkway that connects the central Tree of Life/Discovery Island area with the Flights of Wonder/Asia themed area. 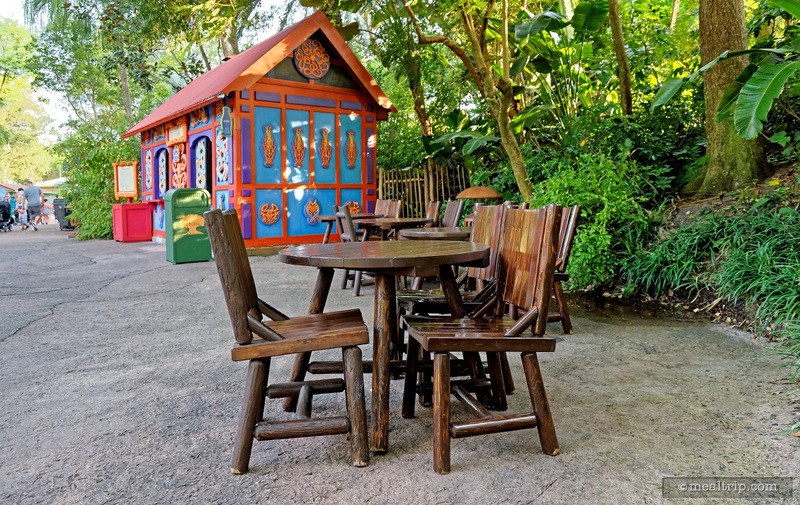 While there is not much seating directly around the kiosk, seating at Flame Tree BBQ and a smaller seating area across from the Flights of Wonder show are about the same distance from the kiosk, and easily in walking distance. The beautifully styled kiosk features some less-exotic snacks that will appeal to those looking for theme-park styled items. Plain and Jalapeño Pretzels are available here, along with a couple of comfort food Macaroni & Cheese items. 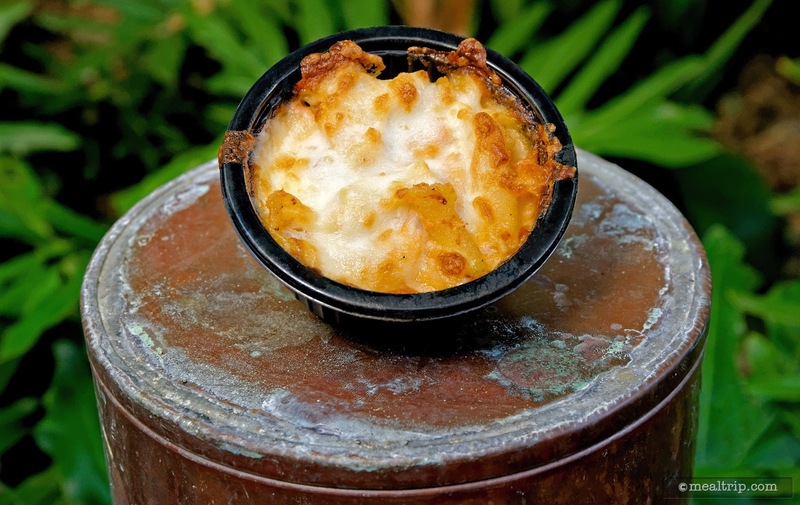 Actually, the Mac & Cheese selections here, pair very well with most of the BBQ items from the nearby Flame Tree BBQ. 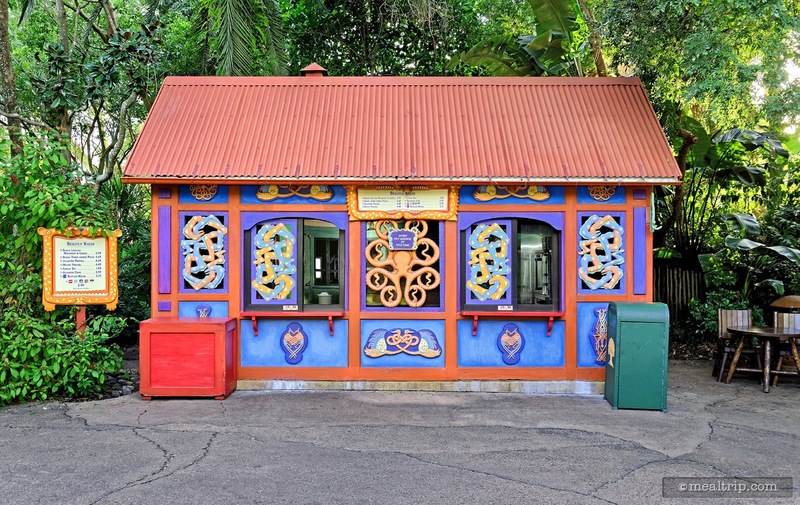 On a recent stroll though Animal Kingdom I stopped by a brightly painted, blue and purple, red tin roofed kiosk named the Beastly Kiosk. Researching these things is part of what I do, so I knew it was there, but you will have to look carefully at the menu board (or your receipt) to discover that you may be standing right in front of it. This particular booth is in the Discovery Island (center) area of the park and to the due west (right side) of the giant Tree of Life. If you have found a Mickey and Minnie meet and greet building called "Adventurers Outpost", you're in the right area. 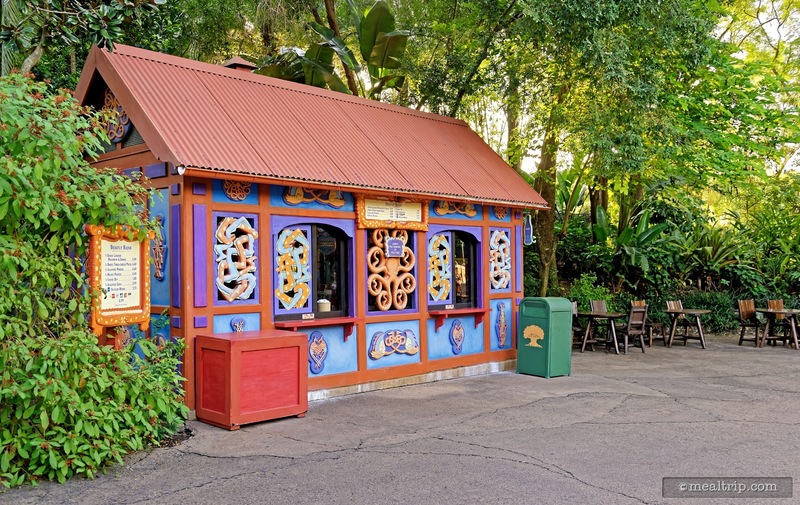 There is a growing collection of semi-marked food kiosks at Animal Kingdom, and there's no way to know if they have been set up permanently… or if this is just a "stop gap" of sorts, until more restaurants are built over the next several years. I kind of like all of these one or two item food booths though. It's sort of like Animal Kingdom's very own, unofficial Food and Beer Festival (because well, there's more craft beer around than wine, but you get the idea). 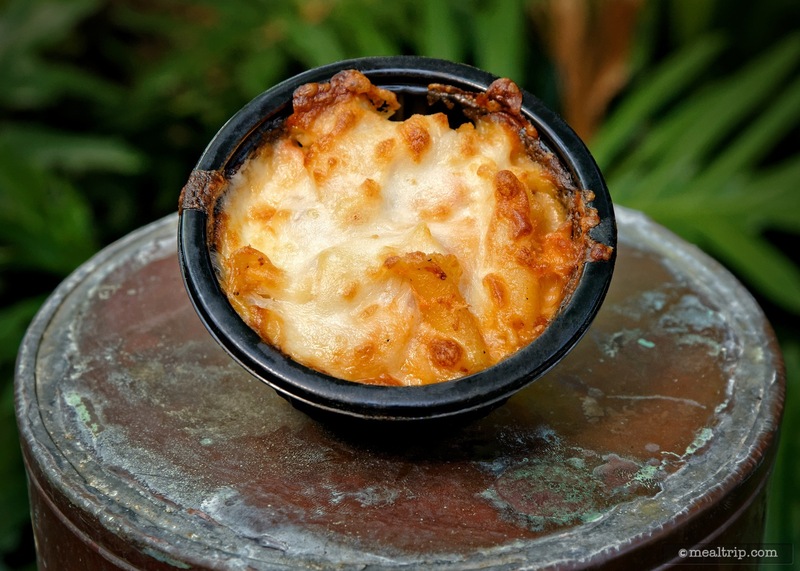 Beastly Kiosk features two pretzels, a Mickey Pretzel and a Jalapeño Pretzel (the latter, I'm assuming, is not in the shape of Mickey's head) and also two cheese and pasta cups… the Baked Three-cheese Pasta and a Baked Lobster Mac & Cheese. Now, I'm not sure how they get "Beastly Kiosk" from any of that, but I suppose "Lobster & Pretzel Kiosk" just doesn't have the same ring to it. Having had a pretzel before, I decided to try the Baked Lobster Mac & Cheese. The cup size, is small… but lobster "anything" in the Disney park system seems to be a pricey endeavor. The "New England Lobster Roll" at this year's Food and Wine Festival (2015) was $7.50, and amounted to 1/3 of a hot dog bun, with about two tablespoons of Lobster salad stuffed in it… so I wasn't expecting to see too much of the marine crustacean in my $6.49 Baked Lobster Mac & Cheese from Beastly Kiosk. Fortunately, this turned out to be a very well proportioned dish (as long as you're not just trying to justify the expense). The small cup was handed to me on a paper plate because it was very warm and stayed warm during it's journey to the nearby Flame Tree BBQ seating area, and all while I was eating it. There's a nice "baked" yellow and brown layer of melted cheese on the top of the dish that gives the mac & cheese a bit of crunch and solid texture. The cheese pasta underneath stayed fairly oozy while I was eating the item and only started to congeal a bit toward the very end. While you are not going to find any generous chunks of lobster in the cup, there were enough shredded red lobster bits to give the dish some color… letting you know there was more going on in there, than just Mac and Cheese. The lobster flavor sat nicely along side the cheesy pasta, and my only real complaint was that it could have been a few tablespoons larger. It is fun trying to find these various kiosks while at Animal Kingdom, and then sampling their one or two offerings. So far, I've found the food quality for those items to be right on, or slightly higher than the various counter service options at the park. If you are paying out of pocket for these "snacks" (as it were)… the experience ends up being a lot like the Food and Wine Festival, with most items ranging from $4.50 to $7.50, although I do think that the portion sizes are "marginally" larger here. Also like Epcot's Food and Wine Festival, you will be stroll-eating or looking for a flat surface and chair with plate-in-hand. None of the small booth "environments" have dedicated seating beyond one or two tables. They are close to larger common seating areas though, as long as you hunt around a bit for those.